Rock-solid response and precise control. 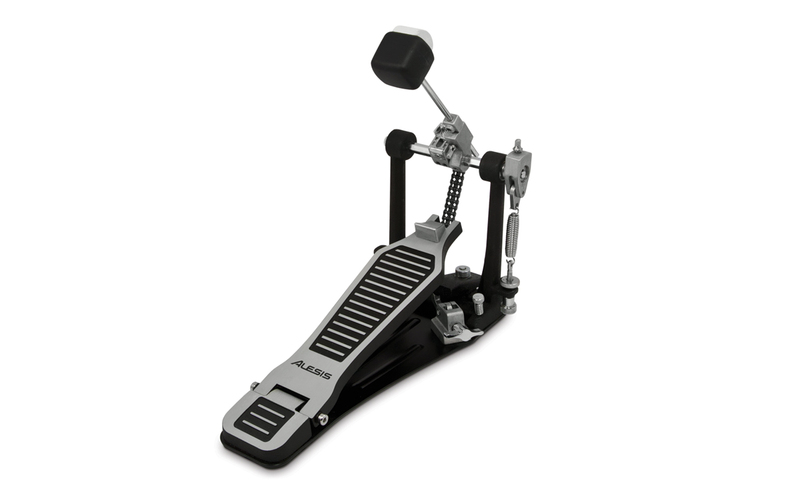 With the Alesis Pro X Kick Pedal, you get a professional bass drum pedal built for rock-solid performance. Whether you play an acoustic or electronic set, the Pro X Kick Pedal is loaded with heavy-duty adjustable components, making it the right choice for every drummer and the perfect addition to any drumset. The Pro X Kick Pedal is ready to take a beating. Its double-chain drive system gives you explosive power and ultra-tight response, and the entire pedal sits on top of a heavy, solid-steel power plate—The Pro X Kick Pedal is going to stay put, wherever you put it down. A four-sided beater with easy height adjustment and memory lock, make the Pro X Kick Pedal perfect for drummers who want precise attack and ultimate control over their kick drum. The Pro X Kick Pedal comes ready to adapt to any style of drumming. With gearless stroke-length adjustment, an ultra-high tension adjustable spring and a toothless X Cam, the Pro X Kick Pedal allows you to dial in the exact feel you want, providing power, smooth precision and speed. One of the Pro X Kick Pedal's most convenient features is its offset hoop clamp—you'll be able to clamp the Pro X Kick Pedal to your bass drum in seconds at every gig, giving you more time to play and less time setting up. The Pro X Kick Pedal from Alesis.